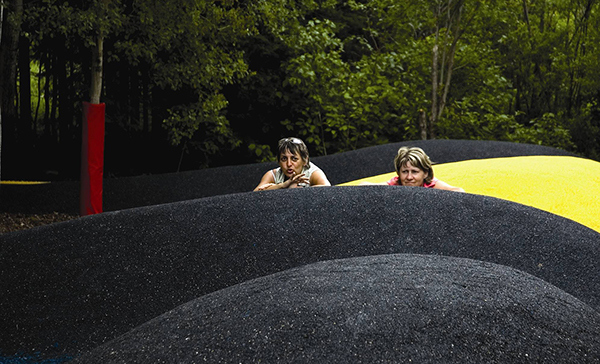 Safe Zone is a garden installation selected through a competitive process for the International Garden Festival at Grand-Metis, Quebec. The proposal is a reformulated pleasure garden utilizing a range of off-the-shelf safety products turned or stretched to new ends. 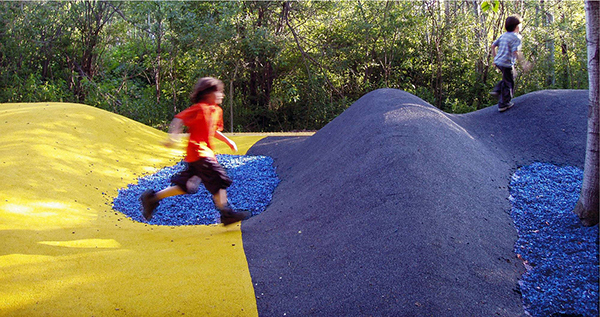 We utilized an array of readily available commercial products designed for potentially dangerous conditions and situations, yet turned to playful uses: poured-in-place rubber surfacing made from recycled rubber, plastic warning strips, traction mats, goal post bumpers— materials of everyday landscapes (subway platforms, sidewalks, playgrounds, sports fields) isolated and coerced into a provocative and interactive garden installation. 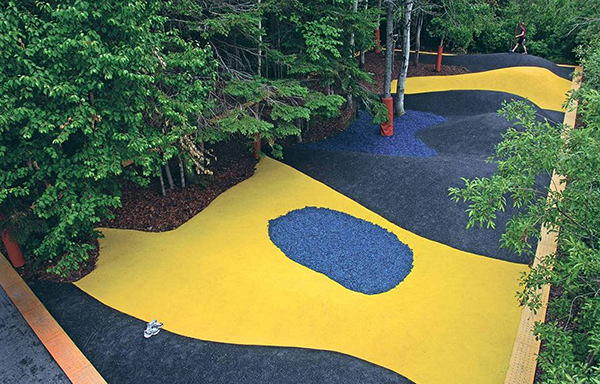 The garden is a topography of code and regulation—essentially manufacturing three-dimensional garden conditions (hillocks and valleys) that would require protective measures and materials. 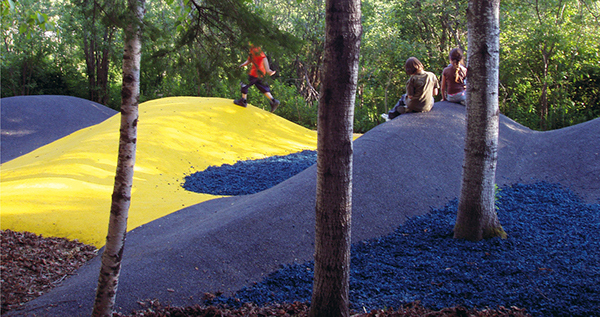 The undulating, synthetic surface we designed was stretched over a rippling, activated groundplane woven into a clearing in the woods. The result is an an open, undulating topography, fluid in its definition and purpose, available for unconstricted exploration and experimentation. 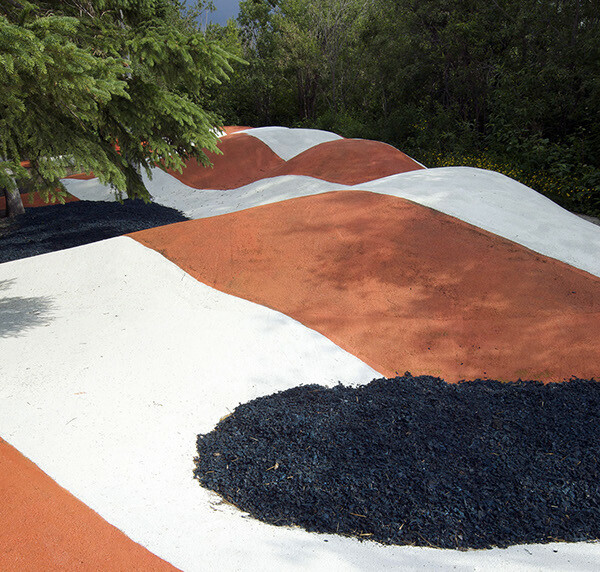 Installation by Garden Staff under the direction of Yvan Maltais. Other services and materials donated and discounted by Jim Knowles and Paul Wellington, Cape Fear Systems, Solplast, Recovery Technologies, US Rubber Recycling, and Sof’Solutions.